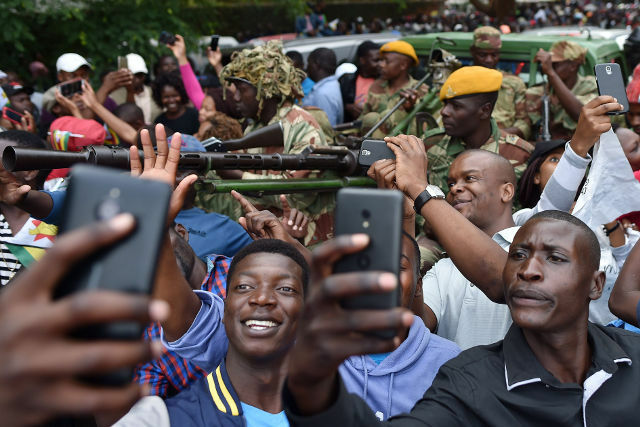 One year after jubilant residents celebrated in the streets of Harare when Zimbabwe’s army removed Robert Mugabe from power, the country is in darkness. Last month, after days of protests over a doubling of fuel prices, security forces launched a crackdown in which 12 people were killed and 600 arrested. Zimbabwe’s government also ordered its first, countrywide internet shutdown. In the year since the ouster of Mugabe—who once proclaimed “only God will remove me” – Zimbabwe’s economic problems have worsened as the country wrestles with vast debts, a battered infrastructure, soaring food prices, hyperinflation and unemployment. Having failed to bring prosperity, Zimbabwe’s government now seems determined to establish dominion over all aspects of its digital and public spaces. As it enlists foreign firms from China and Japan to help build a surveillance state, activists and researchers are worried that what lies ahead could be worse than the Mugabe era. The Japanese contract is part of a wave of imported surveillance tech. Another is China’s recent involvement in building a national artificial intelligence facial recognition database. According to a report in China’s Global Times, CloudWalk Technology, a Guangzhou-based startup signed a deal with Zimbabwe last year to provide facial recognition software for public use throughout the country. The agreement is part of “Belt and Road,” a Chinese soft-power initiative and will extend to building infrastructure like airports, railways and bus stations as well as smart financial systems. China has traditionally been a close ally of Zimbabwe and is the single biggest financial investor in the country’s beleaguered economy. China has invested billions in diamond and platinum mines, new highways and electricity-generating dams. The deal potentially means Zimbabwe is one of the first countries in the region to adopt this kind of technology. CloudWalk uses 3D light facial software, which is better than traditional facial recognition at reading dark-skinned faces. Crucially, the deal will let CloudWalk train its algorithms on data taken from Zimbabwean citizens. The resulting information will help China build one of the world’s most comprehensive and racially-diversified facial recognition databases. This has activists worried. Essentially, Zimbabwe may be giving away large amounts of private data on Zimbabwean citizens to an unaccountable overseas tech giant. Chinese companies have also signed similar deals have in Angola and Ethiopia. Another Chinese deal involves the Zimbabwe Republic Police, which has jumped onto the authoritarian technology bandwagon and is due to introduce powerful night vision surveillance cameras across Harare. Drivers will be asked to install dashboard mounted cameras and upload videos of driving infractions to a Dropbox folder. According to police, the goal is to curb driving violations and crime. The Dropbox captures the names and email addresses of motorists and citizens who upload any footage. A Chinese company, Hikvision, will provide the police with high-tech surveillance cameras. Hikvision is closely involved with large-scale surveillance projects across Xinjiang, where the Chinese government is persecuting Uighur Muslims. One projectwon by Hikvision in Urumqi is worth $79 million and incorporates some 30,000 security cameras. Hikvision’s projects also utilise video analytics hubs, big data centers, police checkpoints and drones. Harare City Council have also separately spent $2 million installing Hikvision surveillance cameras at traffic lights across the city. “The cameras will help identify traffic offenders, especially those who impede the smooth flow of traffic” said the city’s chief engineer of works George Munyonga. The cameras will monitor all roads and parking spaces within the central business district. Installation of the network is 70 percent complete. “As an army, at our institutions of training, we are training our officers to be able to deal with this new threat we call cyber warfare where weapons [are] not necessarily guns but basically information and communication technology,” said Valerio Sibanda. More worryingly, he thinks the army successful manipulation of digital technology to suit its goal of portraying an “open and peaceful” transfer of power could be widely copied across Africa. Ray Mwareya is a journalist and fellow of the ZKM.de Global Exhibition on digital surveillance. His work has been published in The Guardian, Reuters and the Financial Times. This article has been republished from Coda Story with permission.